For some reason, the music industry has long conflated singer and songwriter as if the acts of creation and expression were one job. But 2014 saw many artists take inspiration from the pens of others, resulting in some remarkable and incredibly diverse covers albums. 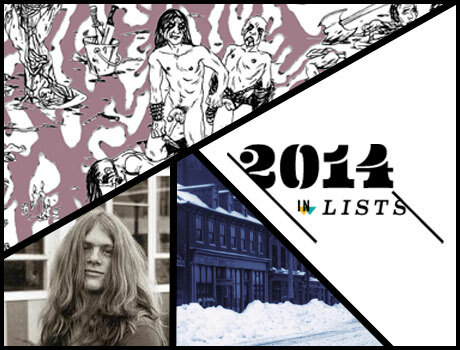 Check out our Top 10 Covers Albums of 2014 below, but don't forget to head over to our 2014 in Lists section to see more of our Year-End coverage. If you've ever listened to the Beach Boys' "God Only Knows," Bob Dylan's "Lay Lady Lay" or the Beatles' "Any Time At All" and asked yourself what those songs might sound like topped off by Bryan Adams's raspy, emotive voice, 2014 was a good year for you. On his first studio album in six years, the quintessential Canadian rocker reached way back into his past to resurrect an album's worth of material that inspired his teenage self. And even if you didn't know you wanted to hear expertly produced, Adams-led renditions of Muddy Waters, Creedence Clearwater Revival or Chuck Berry songs, there's no denying they come straight from the heart. With nearly 40 albums over a 60-year career, Aretha Franklin is better poised to be covered than to be the coverer. But in October, the Queen of Soul dropped Sings the Great Diva Classics, which saw the entirely able 72 year old put her stunning, soul-filled touch on ten classics by divas she's both inspired and been inspired by. A juxtaposed one-two punch of Etta James's "At Last" and Adele's "Rolling in the Deep" opens the record, followed by the likes of Alicia Keys' "No One" and Gloria Gaynor's "I Will Survive." Not that we needed any more proof Aretha is a great diva herself. In 2004, Canadian drummer and entrepreneur Dave Ullrich thought he'd create a label and online store called Zunior to release and sell his friends' music. As August's Tony Dekker Sings 10 Years of Zunior proves, Ullrich had some pretty talented buddies. To mark the site's 10th anniversary, the Great Lake Swimmers frontman lent his gentle voice and guitar to some of his favourite tunes by artists like Old Man Luedecke, Chad VanGaalen, Cadence Weapon, Ohbijou and Jim Guthrie that found a home on the site. Besides being a resonant and incredibly skilled tribute to the musicians it covers, the album is a testament to the lasting integrity of Zunior. Only Zooey Deschanel could record a cover album of mid-20th century hits that sounds as vintage as the source music itself. Alongside a 20-piece orchestra and Portland guitarist and songwriter M. Ward, the other half of retro-pop duo She & Him, Deschanel croons her way through 13 touchstone tunes by Sinatra, Costello, Presley, Armstrong, Fitzgerald and more (they weren't kidding when they called the December record Classics). The song selection is unsurprisingly stellar — these tunes' shelf life alone speaks volumes — and there's perhaps no act more fit to revisit them than She & Him. When Neil Young released A Letter Home in May, less attention was paid to the songs that the Canadian icon covered (is it all that surprising that Young wanted to play 11 songs by inspirations and contemporaries like Dylan, Lightfoot, Springsteen and Nelson?) than the sound quality of the record itself. Young recorded the album of solo acoustic performances in a restored 70-year-old Voice-O-Graph vinyl recording booth at Jack White's Nashville studio. To describe the muffled, crackling aesthetic of A Letter Home as "lo-fi" would be an understatement. But its gloomy rawness is precisely what makes it so powerful.